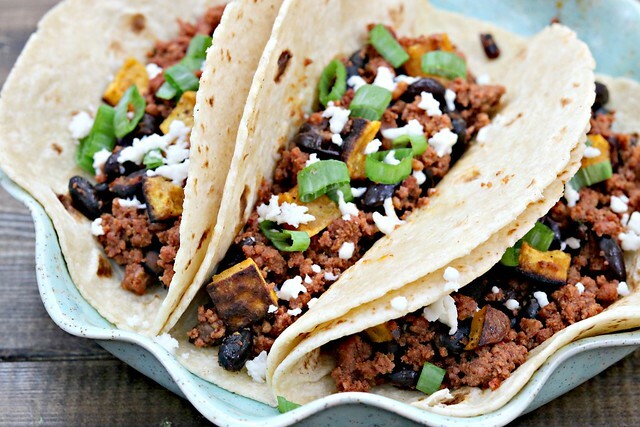 Spicy chorizo, black beans, and roasted sweet potatoes combine to make one fabulous taco! Hiiiii, friends!! I know, I know…it’s been three months since my last food post. Sure, there were a few weekly menus posted, and an update about my new job sitch. But…the FOOD! The reason you all really come here. And I’m sorry it’s been so long. I wish I had some exciting reason for my absence, but…it’s just been life. New schedule, new routine, and trying to adjust. You forgive me, right? I am in the midst of (still) trying to figure out a schedule and routine that allows me to get all of the things I’d like to, done, and still get sleep. Because, apparently 24 hours in a day is not nearly enough. 30, maybe. Even that might be pushing it. So, prioritizing and making a schedule that I can actually (want to) follow is key. I miss blogging. I still cook every night, but the time to photograph, edit pics, write posts, post on social media – it just hasn’t been there. But I’m trying to fit it in. To put it a little higher up on the list of priorities. And I thought, what better day to jump back into it than Tuesday. Because, y’all know how much I love me so me Taco Tuesday. And, with deer season having just ended, it feels only right that I share a taco that can use some of that tasty venison – chorizo! Of course, you can use whatever type of chorizo you have or prefer, but for those who have some venison chorizo, I highly recommend you use that. Because, yum. These tacos are almost indescribable. 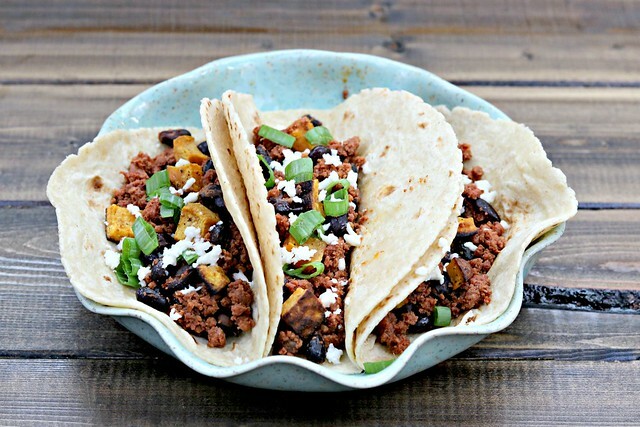 I mean, spicy (or not) chorizo, black beans, and roasted sweet potatoes offer such a variety of flavors and textures, and then you add crumbled queso fresco and crunch green onions, and wrap it all in a soft, warm tortilla. Seriously. How do I even tell you all how incredible these tacos are?!?!? Oh, and if you add some sour cream (or LIME sour cream) and/or some homemade salsa…I just can’t even. Perfection is what that is. And now you have no choice but to try and see for yourself. Preheat oven to 400 degrees F and line a baking sheet with foil or parchment paper. Toss sweet potatoes in a bowl with olive oil and salt, until evenly coated. Pour onto the prepared baking sheet and roast for 25-30 minutes, until softened and lightly crisp on the edges. Remove and allow to cool. Meanwhile, add 2 teaspoons of oil to a large skillet over medium-low heat. Add in chorizo, and cooking, stirring and crumbling, until it is cooked and not soupy looking. Drain grease and return pan to burner. Add roasted sweet potatoes and black beans. Stir to combine and allow to heat through. Warm tortillas, fill with chorizo mixture and top with green onions, cotija and a squeeze of fresh lime juice, plus any other toppings you like!